Despite having a cool-looking production for once, the Wiener Staatsoper’s photos have failed me again, hence the above. Everyone wears turbans, obviously, which is only fitting for an opera full of screaming divas. This iteration of Harry Kupfer’s production, with Janice Baird and Agnes Baltsa conducted by Peter Schneider is surprisingly not bad, which is not the same as saying that all of it is good, but you could do a lot worse. Strauss, Elektra. Wiener Staatsoper, 3/24/2011. Production by Harry Kupfer (revival), conducted by Peter Schneider with Janice Baird (Elektra), Agnes Baltsa (Klytämnestra), Silvana Dussmann (Chrysothemis), Ain Anger (Orest), Michael Roider (Aegisth). It looks pretty good! A giant statue, presumably of Agamemnon, is seen from the knees down, its toppled head hanging out off to the side. 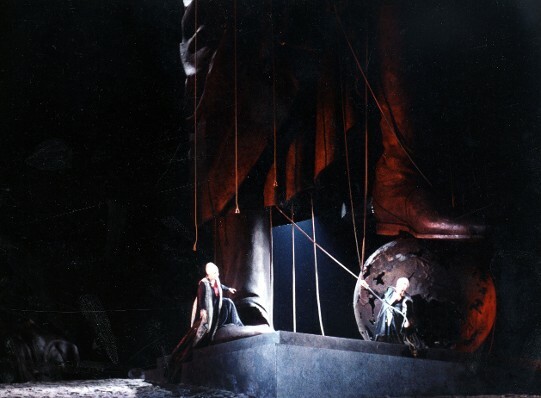 (I think the Met Elektra also involves a toppled statue?) It is stark, the lighting is starker. We open with some slaughtering and business with meat-hooks, but for the most part the production as seen now is totally conventional. Only the absence of an ax in the finale is unusual. The costumes mix a variety of periods: generic Middle Eastern, futuristic sci-fi, and a little fin-de-siècle with some epaulets and a sequined gown for Klytämnestra. The raked stage and darkness reminds me of the Staatsoper’s recent new Mozart productions... oh, the sets and lights for both were designed by Hans Schavernoch. Figures. I was surprised how much this look helped things feel fresh, because interpretively there isn’t much going on and the Personenregie was not any better than your typical revival of a 1965 Boleslaw Barlog production. Kupfer is a good director of singers and I think it’s fair to guess that this production originally succeeded on this count. But any trace of that has disappeared in this 55th performance of the production. The blocking was a typically bad case of unmotivated milling around, with a few stretches that were horribly static. There’s a lot of pushing and knocking people to the floor. That fits this opera, but when done unconvincingly it just looks dumb. But there were musical rewards. Peter Schneider can usually be counted on for a better-than-average workmanlike performance, but he was having a good night, and got the orchestra to turn in an exciting, churning, tense evening that occasionally made it to (sorry) Elektra-fying. It was all very loud and often drowned out the singers, who were constantly struggling to be heard, but come on, it’s Elektra. If there’s ever an opera where the orchestra deserves to be too loud, it’s this one. Shame that the Staatsoper seems to have cast a bevy of Mozart singers as the serving maids–they were overpowered almost completely. We can only hope these ladies aren’t also all going to be valkyries in a few weeks. Janice Baird’s angular profile looks perfect as Elektra, but her performance had a lot of ups and downs. She took almost the entire opening monologue to warm up, sounding cloudy and underpowered (OK, against the Orchestra of Doom), but over the course of the opera her voice became more steely and cutting. A good effort, overall. Theatrically, a few well-observed acting details stuck out, but for the most part she was too static, particularly in the opening monologue where she was confined to a foot of the giant statue, gripping some hanging ropes. She and Orest cannot free themselves from these ropes attached to Agamemnon’s statue! The symbolism, it overwhelms. Silvana Dussmann was new to me and a pleasant surprise as Chrysothemis, singing with a passionate outpouring of sound in a very nice full jugendlich-dramatische soprano. Her middle voice is her strongest feature, and sometimes her top notes would turn shrill and thin. Agnes Baltsa is older than dirt (though she isn’t admitting it in her headshot in the program), and was never really a Klytämnestra voice if you ask me. There are some holes in her range and the tone is threadbare and has an unpleasant nasal edge. But what she lacks in voice she achieves in vicious dramatic histrionics, and she can sing the part, just not terribly well. I preferred Felicity Palmer at the Met last year in this role, while I would choose both Baird and Dussmann over their New York counterparts Bullock and Voigt. Ain Anger was an exceptionally good Orest, singing with warm tone and excellent attention to the text. I am now looking forward to hearing him as Hunding in Walküre. Michael Roider was a sufficiently abrasive Aegisth, but sounded rather better than most do in this role. The supporting folks struggled against the orchestra with varying degrees of success–as all the leads did throughout the evening. After that mediocre Salome I had low expectations for this one, but it is in fact totally worth seeing. All my bows photos were blurry this time but I did get this shot of the surtitles’ odd closing. After Elektra? Really? Production photo copyright Wiener Staatsoper. Doesn't R.Strauss resemble the young Werner Herzog? Mozart is probably weeping in his grave. Recently his name has often been evoked not to praise singers' mellifluousness, pure tone, and clean line, but to denounce their lack of a robust voice. Everyone ages–"older than dirt" is unnecessarily unkind and irrelevant to a performer's substandard singing. LOL, Inter_mezzo, indeed. My Strauss is too early for Elektra but it was the one that allowed for optimal turbanization. Huh, Anon, tone on the internet is hard, I actually meant "older than dirt" with affection. It's not really the right role for her, but she's still kinda badass. And by Mozartean maids, I literally meant that these ladies sing a lot of Mozart (all three of my Three Ladies from November's Zauberflöte were there). Mozart roles are usually given to younger, smaller voices. Singing anything in Elektra against this orchestra requires brute strength. Without any doubt, it was 'Elektra' – Richard Strauss' most powerful, richest, boldest score was played there with unsurpassable conciseness of the motives but also in all imaginable pomp and shading of colors. Gorgeous! Schneider ignores the singers completely and the orchestra plays like a brass band. Not together – ZERO piano passages. Completely unable to accompany the stage. The quality of the orchestra was very, very dissapointing. We were at the same performance; we were thrilled to be in the Staatsoper and the experience was (as you write) Elektrafying. We were in above the orchestra and OMG that delirious wave of sound! Despite the volume, Peter Schneider brought out wondrous textures that I'd never heard before. Janice Baird was indeed tentative at the outset but quickly inhabited the role with almost maniacal glee. Dussmann soared over the orchestra–I wondered why it wasn't she who had the title role. Anger was the standout: forceful baritone and a compelling actor. Baltsa had hauteur and haughtiness; her voice didn't sound threadbare to me. The post-apocalyptic production works, even if the symbolism is overwrought, especially with the servants gathering bloody animal quarters. Fits right in with the grisly libretto. I thought the servants looked like refugees from Return of the Jedi. I wouldn't have missed this for anything. Thanks so much for your blog; your posts on Vienna have been the best source for me to figure out what to hear in Vienna. I'm only going to have time for one music event, and I'm trying to choose between the Elektra at the Staatsoper or the Nozze di Figaro at the Theater am Wien. Which would you recommend?